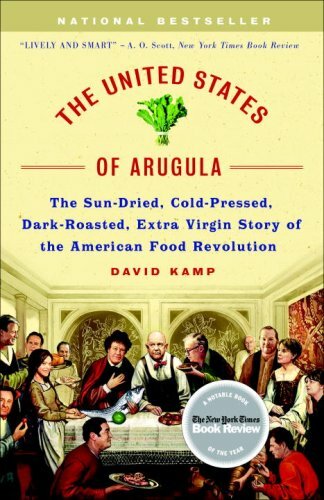 The United States of Arugula is the story of an American revolution—the dramatic culinary changes that brought robust international flavors to a table formerly piled high with bland meat and potatoes. Who was behind this transformation, bringing salsa to the typical American pantry and sushi to chain grocery stores? When did macaroni become “pasta,” while celebrity chefs and organic produce became part of our household vocabularies? A thrilling ride through decades of innovation and food politics, The United States of Arugula delivers a wickedly entertaining history of these cultural sea changes, from the emergence of Julia Child’s beloved but often-spoofed television breakthrough to the rise of West Coast gourmet vegetarianism, and the contemporary lodestars who now heat up the Food Network around the clock. Brimming with insider details and rarely reported anecdotes, this is a cultural history any book club can savor. What are your best and worst childhood memories of food? Are your eating habits better or worse than those of your parents? Which of the transformations described in The United States of Arugula has been most relevant in your lifetime? What aspects of the Big Three—James Beard, Julia Child, and Craig Claiborne—made them unlikely figures in launching America’s culinary revolution? At the same time, what made them perfect for this role? How would they fare if they arrived on the current food scene now and tried to launch their careers? What discoveries did you make about early American cookery, and the palates of nineteenth–century Americans? What does the history of a nation’s food indicate about the history of its populations? Discuss the counterculture movements of the food world described in chapters five and six. What did the stars of this show—including Alice Waters, Jeremiah Tower, and Mollie Katzen—prove to East Coast gourmands about American palates? How did the West Coast revolutionaries manage to sway food dialogues nationwide? What is distinctly American about the success of smaller venues that grew to have broad appeal—such as Dean & DeLuca, or ice cream shops like Steve’s or Ben & Jerry’s? Can such companies grow infinitely without reducing quality and without giving frontline employees an unfair deal? Discuss the ways the food revolution has led to markets for products besides food, such as the wares sold in stores like Williams–Sonoma, or the craze to remodel kitchens with restaurant-quality appliances. Have you made any kitchen purchases that would have been unheard of in your family in previous generations? To what extent does quality home cooking truly rely on tools of the trade? What did <?xml:namespace prefix = st1 ns = "urn:schemas-microsoft-com:office:smarttags" />America‘s early resistance to ethnic cuisine say about American society? What did it take for Italian restaurateurs such as Sirio Maccioni to transform the Francophile definitions of haute cuisine? What international flavors proliferate in your community? Can you trace their arrival, and the way such restaurants were initially received? The United States of Arugula clearly demonstrates the power of food critics in shaping our attitudes about various cuisines, but do you believe they are the power brokers in this story? Who ultimately is at the helm of these transitions: Chefs? Restaurateurs? Reviewers? Highbrow consumers? Average home cooks? Why do you suppose the history of America’s culinary transformations volley from the East Coast to the West Coast, with Charlie Trotter in Chicago as a rare Midwest voice? What is it about these two coastal populations that placed them at the forefront of change? Do they have a monopoly on the food world’s palate? What has been the effect of television in changing the way we understand culinary trends? Discuss the evolution represented by the span of “The French Chef” to “Emeril Live!” What is your reaction to cooking shows? Do you actually write down the recipes and try them out, or is it simply entertaining to watch the act of cooking? Do national chains such as Starbuck’s and Whole Foods make it easier or harder for independent food start–ups to thrive? Has their presence had any impact on your cravings, or on the way you shop? Do you consider yourself a foodie? Does the existence of a “foodie” culture reassure you or irk you? What differences did you detect between notions of culinary arts as a man’s world or as a woman’s world throughout the decades covered in the book? Whose domain does it seem to be now? Has this always been the case? In a recent interview for the Broadway Books website, the author observed that “food people are as fascinating–and brilliant, and contrary, and rivalrous, and inventive, and compelling—as rock musicians, politicians, novelists, and movie directors. This book pulls up the curtain on that.” In your opinion, why does the food world receive less media attention than other aspects of America’s cultural innovation? How would you characterize the key players David Kamp describes, and the world they inhabit? Which of the contemporary celebrity chefs named in the book were you most familiar with? What class wars seemed to be simmering behind the transitions described in The United States of Arugula? What aspects of the story demonstrate the power of the elite, and which aspects are populist? What separates the arugula consumers from the fans of iceberg lettuce? What do you predict the next chapter in this saga will be? How will the showdowns between industry advocates of processed food and crusaders for the organic movement end? What will the next American culinary trend look like, and how will it taste?